i'll probably order some today. Ordered a pack 10 of the figure stands today from Neca on their ebay store !! strangest thing is my TRU local to me doesn't seem to carry any neca items... i seen they had some mexco products, never have i seen anything from neca like predators... i guess i just happen to have one of the crappiest TRU stores in the country. I ordered my NECA stands from Gamestop for 10$. If you do it in store you pay in store and get free shipping to your house. They call it Web in Store. They arrived today! Cracked Tusk is the winner of the series for me. 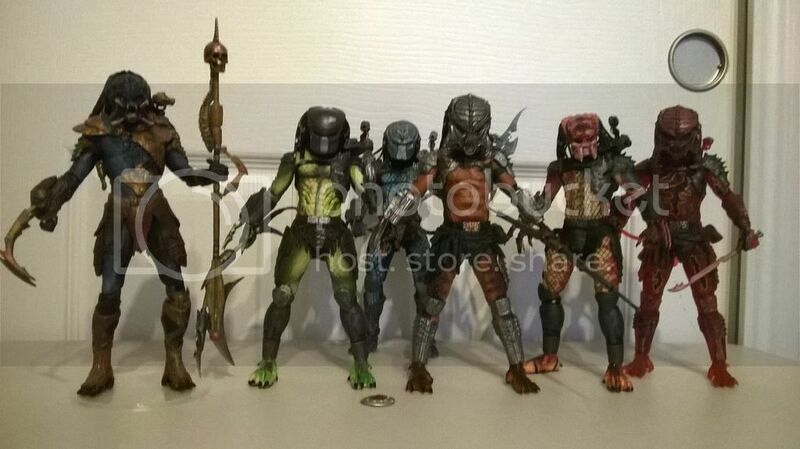 Here is every NECA Kenner Predator together, except for Scavage. I like Nightstorm's look more and I need the shelf space for Celtic when he releases. NICE. The figures really pop when you line them up in a squad, highlighting all the different pigmentation and accents. Thus far, I still have only Jungle Hunter. I can't believe how hard it is to line up some choice favorites on the secondary market. 'Scout?' 'Lost?' 'Battle Armor Lost?' 'Wasp?' HAHAHA! Good luck finding a listing. I haven't checked previous posts. Has someone already linked to the Visual Guide at the NECA website? It's updated periodically. Yeah. I get how Jungle Hunter or City Hunter have such high levels of demand, but guys like Snake, Warrior, and Boar should not be going for near $100. I was afraid the new guys would stick out on account of their unpainted nets, but they fit fantastically. Despite my skipping Scavage I can say series 10 is better than 13 in my opinion. Nightstorm > Scavage by colors (don't get me wrong I still dig Scavage from what I've seen), Lava > Cracked Tusk just barely but I love his translucent red, and Renegade > Hive Wars because his weapons are cooler and I like green more than blue. All 6 are just delightful though. YAH! I like Renegade too, with the original movie mask. It's fun, isn't it? Sort like picking your favorite chocolates. "My mama says life is like a collection of predator action figures..."
so you got both of them huh ? very cool !!! i'll pass on them til when and if renegade gets the yellowish color again and If cracked tusk actually comes with a head that shows his cracked tusk. As for Nightstorm he does look cool looking. i noticed his arm blades are longer then Savage's blades. my figure stands came in, so i ended up using one. scavage is now standing and hopefully he'll stay there lol. you ain't lying.... i've been wanting to get a big red predator, they want just TOO MUCH for him nowadays. 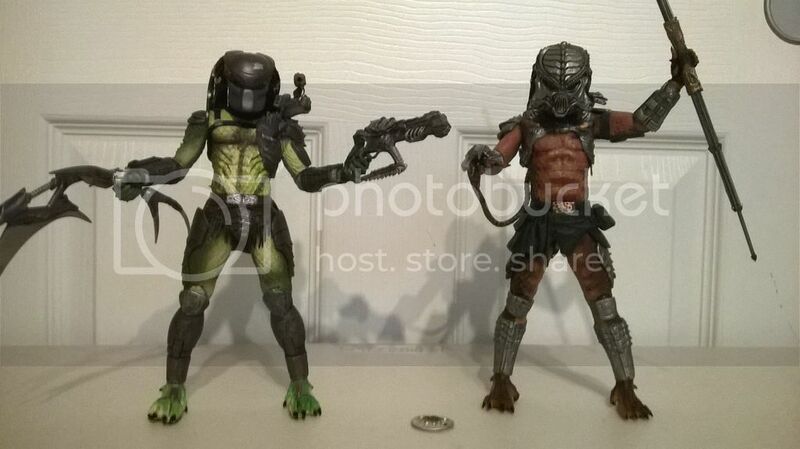 They are making the AVP two-pack. Nothing official yet but I imagine it will be the khaki/blue skinned, brown armored Renegade and an alien (probably repainted Big Chap) with a purple-ish dome. Nightstorm's wrist-blades are pretty long and they do extend beyond how they are in the image I posted, but it's only like 2 centimeters longer when extended. I love their hook/scimitar vibe as it matches his Egyptian theme. Scavage's wrist-blades are actually just the blade from the camo-cloak Falconer, still cool. Has your Nightstorm stayed up on his own since you added the display stand for him ? Standing proud since last February when the stands came out. Just keep him standing straight on a base somewhere stable and no issues should arise. I've never bothered giving Nightstorm (or Scarab if you like) an action pose, but I'm sure it's possible to find one that the base would still agree with. even with the base he took another tumble off again somehow.... His left leg is loose kinda. it's becoming annoying now lol i think i'm going to have to find something to give him some back support. this guy is top heavy. Last edited by donmeca2020; 03-29-2015 at 08:30 PM.. I've lent all of my knowledge on the matter, you'll need to look into some kind of doll stand or something then because you're problem now exceeds my powers, or maybe try the other foot as the one pegged in and if that doesn't work then I'm bust. maybe try choking up on the staff, use it as a third leg to prop him? if not you can apply a drop of super glue to the joint and wiggle it while it cures it'll stiffen up a bit. i was just trying to reposition his legs, and i put him back on the shelf... i need to find some kind of prop or something for either behind him or somewhere near the front of him. literally right after i made this post, i was messing with my comics, i heard the damn thing fall again..... he is now back on my desk, i need to find something to help him stand or possibly position him to lean abit back. 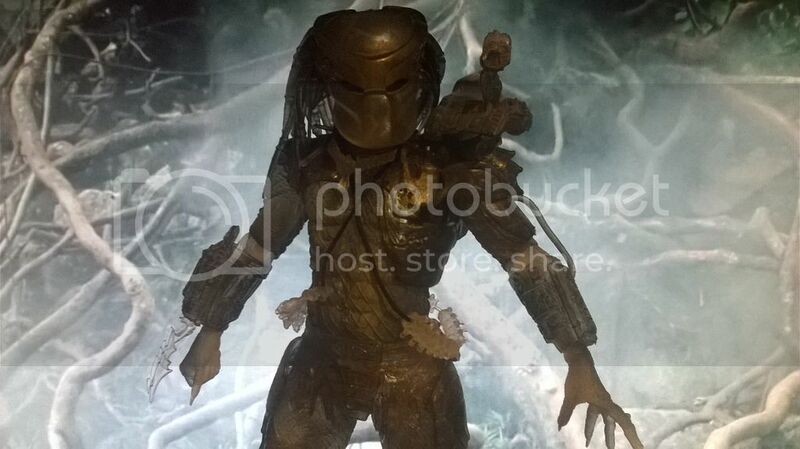 this particular model of predator has different legs as opposed to all the other ones. Last edited by donmeca2020; 03-29-2015 at 10:05 PM.. I'll never be able to figure out just what it is that causes not just Predator, but horror and sci-fi film figures in general to jump in prices the way that they do. I get the whole "limited distribution" and "cult favorites" and all that, but it is ridiculous. Look up the prices of Jason Voorhees figures done by Mezco, older Walking Dead, or Hellraiser figures in general if you don't believe me. Case in point, one of the very few figures that I'm missing from my Predator collection, is the original Falconer and Dog Tracker Predators. The only reason that I never picked them up when I had the chance, was that the line was still in it's infancy, and had really bad QC issues, as most of the ones that I ran into had either broken tusks or wrist blades. I would suggest giving actual doll stands, such as the ones made by Kaiser a try. I had a similar issue with my Walking Dead figures (as some figures do not have pegholes on their feet) and was able to find the right size to make them work. I was able to use those same stands on other figures as well, clipping them on the figure's leg as opposed to their waist. 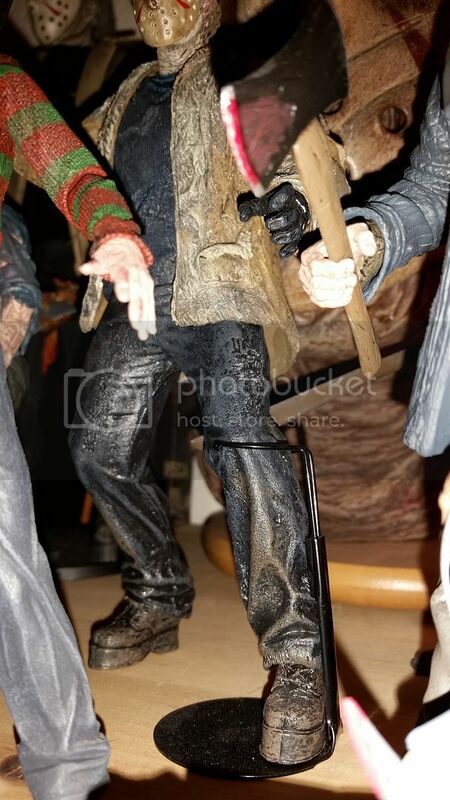 It doesn't get more top heavy than the NECA FvJ Jason Voorhees, and if it keeps him standing, I don't see why it wouldn't work on your Predator there. Although, as I said, Kaiser makes them in multiple sizes and colors, so you can probably just go ahead and get some properly sized for your yautjas. The stands I use can be found on Amazon. There are similar ones coming soon that are sold through BBTS that Pixel Dan and Shartimus Prime recently reviewed and gave solid marks. Those can be found here. Hope that helps some...Good luck. The super predator mold dates back to the first three waves from 2010 and 2011, when v-cuts were all the rage. Sadly the Nightstorm/Scavage staff isn't long enough to act as a support effectively. 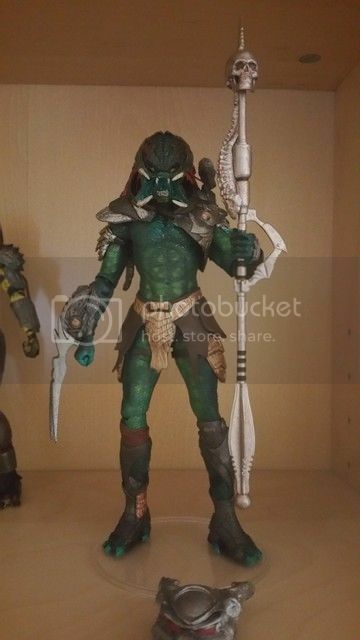 Maybe check a local hobby store, I got a doll stand at Hobby Lobby meant for an 8" doll (I use it to keep my blue alien warrior standing, he has bowed legs) that looks like it would be good for a predator. It wouldn't be aesthetically pleasing but it's under $2. that might be my next idea now. Not sure if we have hobby lobby around my way. This was my first NECA predator and it still ranks as one of my highest. It's not just my only movie based Jungle Hunter but it is also one of the coolest and best scenes from the movie. My first was the Ahab Predator... i was interested in it, because i ended up getting into the Predator Fire and stone comic. after that i decided let me jump on him. while he was more on the expensive side for one of these, i recall getting him for $56 bucks i believe. after that i decided on getting into this toyline and as i did it just got me into old memories of my Kenner predators my mom bought for me when i was a kid.